A book about 'real witches' - the ones that absolutely loathe children and are always plotting to get rid of them. And so we come to the final book in my wonderful Roald Dahl boxset - and it's one of the best. I can remember it terrifying the wits out of me when I was younger, and upon reading it again at the grand old age of twenty-three, I still felt quite uncomfortable in places. It's a dark novel, and incredibly disturbing, but I like the fact that it is. I like falling through the trap door into Dahl's ludicrous worlds and seeing unconventional things happen to the characters. The story is also bittersweet. Our protagonist's mother and father are killed at the beginning of the story and he is looked after by his grandmother. Their relationship is one of the focal points of the novel, and it's truly heartwarming and wonderful. Their mutual love and respect for one another could bring a tear to a glass eye, and this certainly happened to me at one point. Click here to see the page in question. Our protagonist has a horrific encounter with the witches at their annual meeting, is turned into a mouse, and barely makes it out alive. He then goes on to get his revenge, with the help of his lovely grandmother. The ending is oddly satisfying but disturbing; with both of them agreeing they will die at roughly the same time due to the boy's rodent life span. This is a children's book, and I find this part insane and absolutely heart wrenching. There are some scenes in this book that have been imprinted on my brain ever since I was little, and these will never disappear and I will never recover from them. It is truly terrifying, especially for children, but I feel it's one that most certainly has to be read, despite it being absolutely macabre. 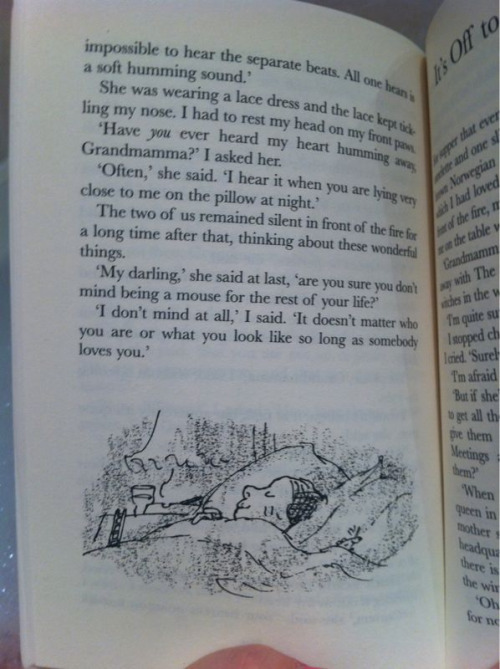 Roald Dahl is incomparable when it comes to children's literature. He shaped my childhood, and carved me a love for reading which is now irrevocable. I have had a wonderful time reading through fifteen of his most famous works, and I think now I'll do my best to source some of his adult fiction, since I've never had a chance to dip into any of that. I'd recommend The Witches and all other fourteen of the Dahl novels I've read this month. The man is one of my heroes and a true inspiration, and he'll live forever in the form of these stories. 15 / 72 books. 21% done!